Researcher Interactions with Born-Digital: Out of the Frying Pan and into the Reading Room – bloggERS! This post is the ninth in a bloggERS series about access to born-digital materials. This past SAA 2015 , I co-presented in the panel “Out of the Frying Pan and into the Reading Room: Approaches to Serving Electronic Records.” My talk focused on a study of researcher interactions with born-digital collections at NYU’s Fales Library and Special Collections, including unprocessed directories of files, emulated works, and migrated software. Given the enormous resources required for born-digital access, our preliminary study sought to understand how archival researchers received this work. This is something that is relatively unexplored in our field thus far. 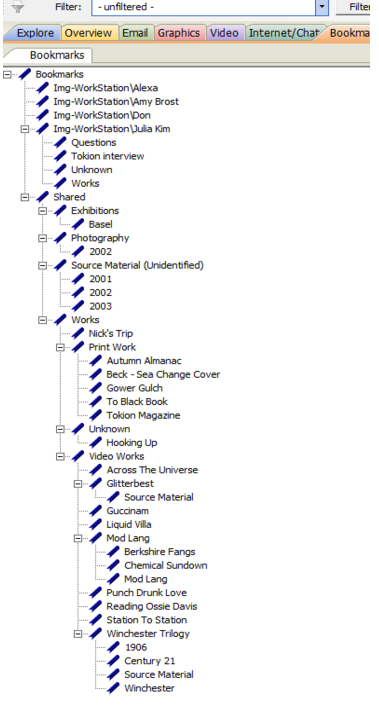 NYU began processing the Jeremy Blake Papers and the Exit Art collection in fall 2014 as a way to test and model “access-driven” born-digital workflows. Throughout the year, we focused on ensuring researchers would be able to access collections before the year’s end. The archives of Exit Art, a non-profit cultural center in Manhattan, were donated to NYU’s Fales Library and Special Collections in 2012 and included analog content, time-based materials, and the organization’s 2TB server. 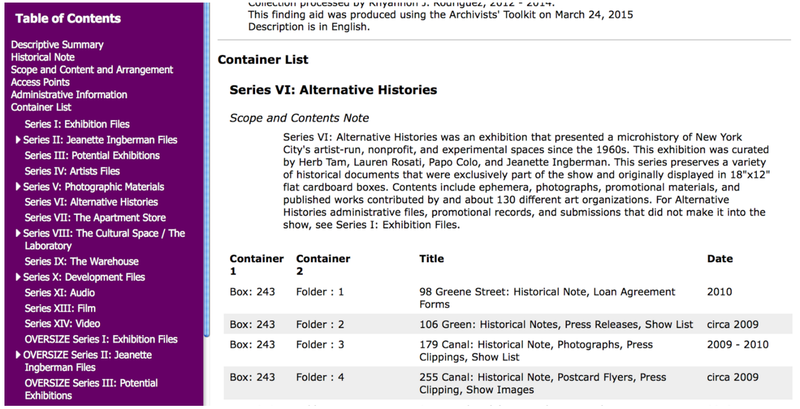 Within the 2TB server, we narrowed the focus for our study to a directory called “Alternative Histories,” which was the name of a major 2010 survey exhibition organized by Exit Art. This small sliver of born-digital files measured 47.6 GB, 18,642 files, and 1132 folders. Contents included administrative files and correspondences, photographs, promotional materials, and published works. Due to time constraints, the Alternative Histories files were not arranged. Jeremy Aaron Blake (1971-2007) was an American digital artist known for his digital c-prints and his looped animated sequences that he coined his “time-based paintings.” The Jeremy Blake Papers included approximately 400 pieces of media on optical media, digital linear tape, and jaz drives; as well as external hard drives and copied files. The majority of his working files are in the Adobe Photoshop formats. The Blake archive afforded a detailed analysis of his working process, which in his case was primarily in Adobe Photoshop files created in the late 1990s-mid 2000’s (more background information here). Five seasoned Fales Library and Special Collections archival researchers participated in evaluating new forms of digital access through an on-site visit to New York University’s Digital Forensics Lab for one to three hours. They were invited to participate due to their extensive familiarity with archival research. While a few of them had some familiarity with the artistic content of the collections, their disciplinary focuses included contemporary art history, 18th-century literature, digital humanities, platform studies, and computer science. Each researcher agreed to be audio- and video-recorded and to the use of Think Out Loud Protocol (TOP), in which they verbalized anything they saw, did, or noticed. Afterward, the interviews were transcribed and the recordings were deleted to ensure anonymity. While we allotted an hour, most researchers stayed longer to explore and discuss. After an initial overview, they were shown the existing Alternative Histories portion of the Exit Art finding aid. They were introduced to QuickView Plus software and the Alternative Histories files on our designated locked down researcher laptop. After 30 minutes, the researchers switched to another laptop that was installed with an emulation to access the Blake collection. Researchers were encouraged to explore the files using the contemporary Windows PC and contemporary Photoshop program, and the software program Forensic Toolkit (FTK), to make comparisons. FTK included a preliminary “bookmarked” arrangement of the imaged Blake files. Researchers were also able to compare the same files, for comparison and viewing, on older computers. In exploring “Alternative Histories,” some noted that future interest in the records could be in the realm of organizational management and administrative studies, rather than in the artistic content of the exhibition files. An arrangement, then, might lose this record of how a small arts organization planned and executed a major exhibition. The directory organization, the many drafts of letters, the records of the organization’s own archival research, for example, might be obscured by processing. The possible value of the “original order” of unprocessed administrative files found in Exit Art was appreciated deeply by the researcher quoted above, in spite of some confusion about how to navigate the unprocessed organizational directories and files. Our evaluation of this researcher’s experience lends credence to the idea of multiple, interactive, and flexible arrangements to support multiple understandings of the collection material. These options are not only increasingly possible, but expeditious and in-keeping with patron expectations of random access, keyword-driven searches. Most of the researchers emphasized that if it came to partially processed files or emulations and a significant time delay in processing, they would take unprocessed and relatively inauthentic files. Access by any means, and ease of access were stressed by the majority. All found the emulation’s authentically slow-processing speed and instability impediment enough to prefer contemporary computing system access. With the exception of one researcher with prior archival processing experience, authenticity was not a concern. While all researchers appreciated the emulation, hearing that they ultimately did not prefer using it was a surprise to me. This researcher was thrilled at the opportunity emulation represented to access born-digital technology dependent artwork. She reflected that had she the opportunity, she might have studied more art “after the 1990s.” Her enthusiasm was both a validation and a call for further work with researchers to study these newly available collections. Because we publicized this user study online in blogs, more researchers have had the opportunity to come in and study with these collections, despite the collections’ “imperfect” and “unfinished” status. While not conclusive or generalizable by any means, these interviews were necessary first steps to begin understanding how these new forms of access were interpreted and received. More information on this research is coming soon! Many thanks to Lisa Darms and Donald Mennerich. Their support and encouragement were essential to this project. Julia Kim is the Digital Assets Manager with the American Folklife Center at the Library of Congress. Previously, she was a National Digital Stewardship Member at New York University where she worked on the project detailed in this post. She received her B.A. from Columbia University and her M.A. in Moving Image Archiving and Preservation from New York University. She can be contacted at juliakim [at] loc [dot] gov and her handle is @ jy_kim29. Previous Article When It Comes to Born-Digital, How Well Do We Know Our Users? I was wondering what exactly do you mean by “unprocessed and relatively inauthentic files”. When you mention arrangement, do you mean physical arrangement of files in the computer? And if so, why would you change the received order? Isn’t that more threat-fully to authenticity that providing an intellectual arrangement? Thank you I am very curious about “original order” and “unprocessed” digital files!